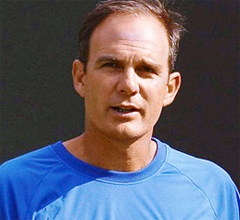 What are the implications of Paul Annacone's seminal insight? As Paul explains in his interview with John Yandell on Tennisplayer (Click Here), players at all levels fall somewhere on the spectrum from the Pure Magician, who prefers to learn by feel and play, to the Pure Mechanic, who prefers to learn through drilling and repetition. Paul also mentions that many players share characteristics of both. This is something I have been found to be true in my own coaching. I call these players "Balanced," though Balanced players are still usually more toward one end of the spectrum or the other. These distinctions may help you as a player or a coach understand experiences you have had in lessons that seemed puzzling at the time. They can also lead to changes in your approach to learning and/or teaching that correspond with the reality of learning style differences. The benefits can be huge. Mechanics are process oriented, analytical players who want to drill, fix, and reinforce their games. They are tinkerers and sometimes chronically worry about their strokes. Some simply want to hit huge numbers of balls, others can obsess on detailed technical issues. 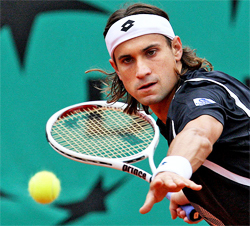 Examples of tour players who were or are Mechanics include: Bjorn Borg, Michael Chang, David Wheaton (an obsessive tinkerer), Ivan Lendl, Jim Courier, Juan Carlos Ferrero, Jimmy Connors, and among the top modern players, David Ferrer. The great Argentine champion Guillermo Vilas may have been the purest mechanic of all time with his legendary 4 hour on court workouts. Magicians are big picture, creative types, who tend to learn the game by feel. They are often tremendous mimics and gifted motor learners. Examples of well known Magicians include: John McEnroe, Pete Sampras, Fabrice Santoro, Marcelo Rios, and from the current game, Grigor Dmitrov. When a Magician "feels" the way he wants to hit a shot, he often doesn't require multiple repetitions to reinforce what he is doing. In fact, he may find repetition counterproductive. This is why Magicians resist drilling and technical analysis - sometimes quite aggressively. 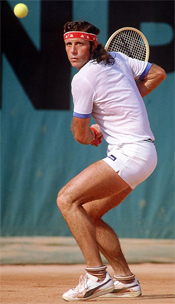 John Yandell once told me the story of how hard it was get John McEnroe to demonstrate basic strokes and shot patterns when they made their famous 1984 instructional video with Ivan Lendl. Mac's words at the time: "You're making me think about where my arms are! I never do this. I'm a no brain player!" Balanced players have some of the qualities of both Magicians and Mechanics, and require a balanced approach with drilling, analysis, and live ball play, although the exact percentages can and will vary. During a recent training session at my academy, I asked a few questions of three of my players who I had previously identified on the Magician to Mechanic spectrum. All were 13 year old tournament players. 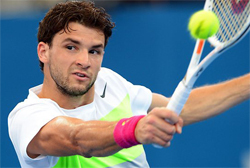 A modern magician: Grigor Dimitrov. First Question: "Do you like to do drills from the basket?" "Yes - because I like to make my swings perfect. The ball comes slower and under more control and I can perfect my swing easier. I don't like the unpredictability of hitting with someone else when I'm working on a stroke." "No! Boring! I'd much rather play points or do something more realistic. I don't drill nearly as well as I play. I always play points better and make shots that I miss when I drill. Baskets give players a false sense of security because they are not real." "Yes and No. I like basket drills if I'm working on something specific. But other than that I prefer game and live point situations." Second Question: How does drilling make you feel? "Confident. When I repeat a shot over and over in a drill, I can make it in a match. That feeds my confidence. Repetition is the key." 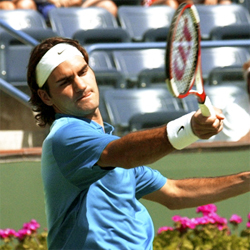 Federer created his famous sideways head position himself. "Drills make me crazy! I just need to get out there and play points to find my confidence. I would improve faster if my coaches stopped making me drill and let me play more!" "I do drills if I need to. They need to be specific to my game. But if they aren't, they don't help." If you are a coach or parent, maybe the words of one of these players remind you of a son or daughter, or of player you currently teach. Or if you are a player, they may remind you of how you felt in a certain lesson with a certain pro. In my view, Roger Federer, Andre Agassi, and Rafa Nadal, are all versions of the Balanced player. Roger is on record as saying he developed his famous, sideways head position on his groundstrokes on his own without coaching input of any kind. That's pure magician. Nadal: practices like a mechanic, but the finish of a magician. But as Annacone points out, even at over 30 years, Roger enjoys hitting lots of balls, a characteristic of the mechanic. Still,when Roger practices, he tends to do so with the flair of a magician, hitting drop shots, insane angles, and even two-handed backhands, especially in front of crowds on the tour practice courts. Nadal's practice in comparison js far more intense and structured, more mechanic like, and similar to his actual match play. Yet Rafa also has magician's flair. No one trained him to hit reverse over the head finishes on his forehand, something that, ironically, has been widely studied and copied by mechanics at all levels. 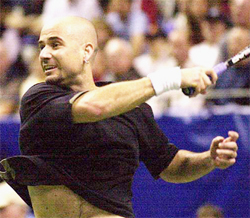 As for Agassi, Andre famously transformed himself into more of a balanced player late in his career, stemming from his relationship with Brad Gilbert. Gilbert, a classic Mechanic, was able to help Agassi, a classic Magician, learn to be more analytical and disciplined in his approach to training and his own court tactical patterns. The results, obviously, were spectacular. Vilas: the ultimate mechanic in tennis history? "I adjust the sessions to the specific character of the player. But at the same time I try to take both types out of their comfort zone from time to time to make them more balanced. "I have managed to turn magicians into more balanced players knowing when to push the kid and when to let him get what he wants. I usually do it with the carrot and the stick approach. "If you do such and such with good intensity you will play points and no drills until the end of the lesson." When you work with the mechanical type you need to take them away from the obsessiveness of hitting every shot perfectly and make them more natural so they can rely on their hands and improvisational skills when things go wrong. But I will still give them what they want in terms of drills and repetition." So where do you fit on the continuum? Do you arrive at your lessons with a list of technical questions, willing to hit hundreds of balls to sort out a stroke? Or are you more likely to ask the pro to play points? Here are some more detailed descriptions that may help you or a coach decide where you are on the Mechanic to Magician spectrum. Mechanics tend to be reserved and quiet and they are often very judgmental of their own progress. Magicians are often extroverted and voluble. Magicians are generally less self-critical and can be blase about their mistakes. 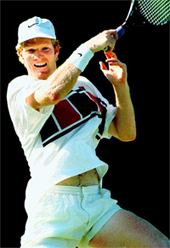 What was Jim Courier doing with a book on a pro changeover? Magicians are generally quite lazy by typical standards, and don't like to practice hard. Magicians undertrain and risk getting out of shape physically. They also risk injury because they often do not diligently practice stretching and other prehabilitation exercises. Mechanics are often a paragon of hard work and professionalism. Mechanics overtrain frequently and risk burnout or injury from working too hard. Do you remember Jim Courier reading a book during a changeover during his burnout period? Mechanics tend to be more perfectionists than Magicians. Mechanics can become so obsessed with their technique and its flaws that they can develop anxiety about their games. Magicians are often happy-go-lucky types, but they can develop anxiety-- not because they worry about their technique--but rather because of their uneven tournament results. Their results can vary widely due to their lack of planning and preparation for upcoming matches or tournaments. Thus they may question their ability and get frustrated when they are not able to overcome match situations with their talent and improvising skills alone. Magicians tend to be visual learners. Talented Magicians can often learn a skill simply by observing a coach demonstration, or even by watching a video clip of a demonstration or seeing another player swing. Mechanics tend to be kinesthetic learners and often need to feel what corrections they need to improve their technique. Mechanics usually will not be able to add a skill by observing a demonstration, and may require a great many repetitions. Influenced by a mechanic coach, Andre became balanced. Magicians tend to be defiant and don't want to follow directions. This makes drilling magicians who have a defiant streak next to impossible. Mechanics tend to be more submissive and are comfortable submitting themselves to the authority of the coach when drilling. Magicians often dress with flare and panache, with bright colors. Mechanics tend to be the collared shirt kids, or the kids with plain shirts and more conservative, muted colors. Magicians often think a game plan is a waste of time. They prefer to improvise in the moment. Mechanics are obsessed with strategy, planning, and scouting, and generally want to be prepared for every possible tactical situation to the point of anxiety. They have trouble improvising a strategy if it wasn't an option in the game plan. Mechanics are self-aware of their own performance, grade themselves based on critical internal judgments, and put a lot of pressure on themselves to play the match "right," win or lose. Magicians care less about their technical form than about winning and the battle. If they get the win, what was the big deal? Pete's play was nothing like his practice. Magicians sometimes lose focus and play points with sloppy form. But they don't care, because, when they are fully energized and focused, their form comes back to them. They tend to be very resilient in this regard. Mechanics don't like to play points unless they believe their technical skills are in order. They believe that playing points with bad form will makes them worse. Mechanics tend to constantly develop little bad habits in their technique that they need to iron out - or think they do. Mechanics prefer drills that are not random or that do not require decision making, in which they know the exact sequence of shots and what is expected of them. They are able to achieve an almost a trancelike focus state over long periods of time. Structured drilling makes a Magician feel bored and straight-jacketed--especially if the drills do not allow for decision making and creativity. Magicians like random drills and shorter duration drills. Magicians, because of their creative drive, will deviate from the prescribed drill pattern and try a wild or different shot than instructed, to the chagrin and frustration of the uninformed coach. Mechanics follow the drill pattern exactly as prescribed, and any deviation from the pattern from the coach will cause them anxiety. When playing points, Magicians tend to be less patient and more creative shot makers. They often try "stupid" high risk shots, especially when a point is boring them. 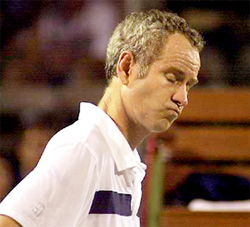 McEnroe: a no brain player who hated drills. Magicians live for creating shots on the court in spontaneous fashion - they feed off those great moments like a drug. They are like jazz musicians who play tennis. Mechanics like to stick to proven patterns that they have trained before. Mechanics play tennis more like concert pianist, playing a piece they have practiced thousands of times before. In practice, Magicians are major time wasters and often spray balls and have trouble maintaining consistency. Mechanics are usually very focused and steady in practice, and they hate to waste time because they are striving for perfection by more repetition. Mechanics are the best ball picker-uppers. Magicians hate to pick up balls, and get yelled at by their coaches for wasting time. Connors and Agassi were famous for their efficient and grueling practices, where they didn't waste a single minute or ball - typical Mechanic tendencies. 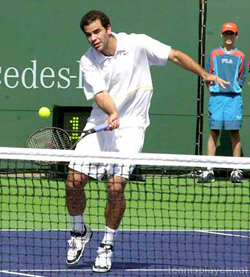 Sampras was known for his lazy and sloppy practices where he would spray balls and make tons of mistakes. McEnroe often refused to practice at all, and would play doubles to keep his "feel." 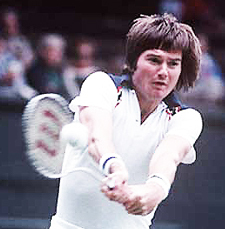 Jimmy Connors: never wasted a grueling minute. Some of the most famous, major conflicts between coaches, parents and players on the professional tours can be explained through the lens of the magician versus the mechanic. When a stubborn coach or parent is in charge of a player who is on the opposite end of the spectrum, there are bound to be major conflicts, failures, and sometimes permanent psychological damage. Coaches often become frustrated when players, who may not match up well to their teaching style, lose interest and plateau in their progress. And the same frustrations build in the players themselves. And for junior players, in the parents. A Magician player and a Mechanical coach will have major conflicts on the court unless the coach adapts his training methods to the player. A Mechanic player and a Magician coach will struggle to achieve rapport and results if the coach cannot be flexible in his teaching style. I can honestly say that my teaching has become much more successful in the past few years by recognizing whether my students are Magicians or Mechanics, or Balanced, and adjusting my training methods accordingly. I feel confident this same insight can make a difference for you as well. Diagnose yourself! Then adjust your lessons and practice based on where you are on the Mechanic to Magician spectrum. Find the coaches and practice partners who can help you create the environment that will maximize who you really are as a player. That can get you over the stumbling block to the next level.